As preparation for my upcoming thru-hike, I did a series of five shakedown hikes last fall ranging in length from two to five days. These proved to be incredibly useful as I continued the process of dialing in my gear and refamiliarizing myself with the physical challenge of lugging a pack up and down mountains for days at a time. 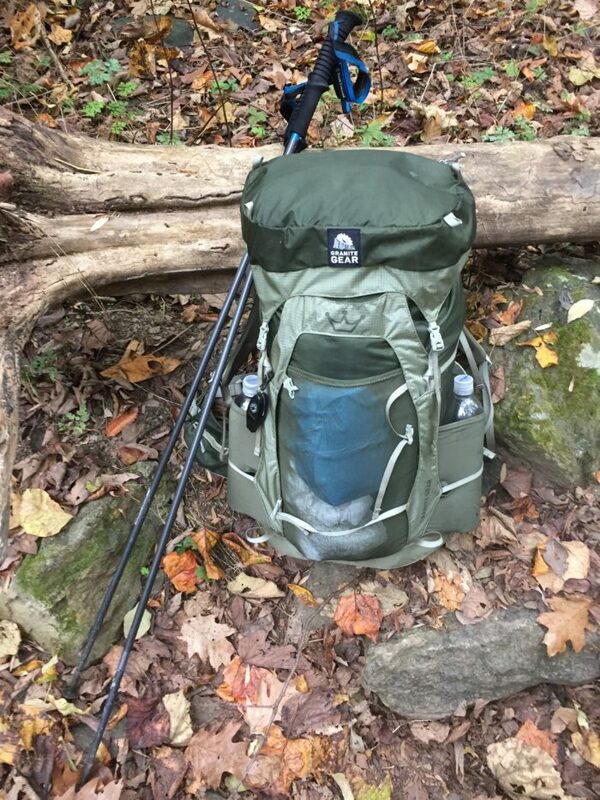 This post includes my observations about some of the gear I used on the last of these shakedown hikes, a five-day out-and-back hike in October starting from the southern entrance of Shenandoah National Park in Virginia and hiking south. Unless otherwise noted, the gear I mention is the gear I have decided to use on my thru-hike. Base weight: My base weight is 17.4 pounds. With a five-day load of water (two liters), fuel, and food, my total weight came in at 30.2 pounds. This was a bit heavier than I was shooting for, but most of it was due to some extra cold weather clothing, experimenting with some luxury (and heavy) food items, and extra fuel that turned out to be unnecessary. For my thru-hike I’ll be aiming for a five-day full load of 25 pounds max. Pack: I am using a Granite Gear Crown 2 pack and love it. This pack is lightweight (2.36 pounds), holds a ton (60L capacity) and has a lot of useful features: detachable brain, hip belt pockets, adjustable hip belt, large mesh pockets on sides and back, and a ridged back panel that I thought worked great in allowing some air between my back and the pack. The pack is rated for 35 pounds and performed great on this trip. All in all, I think this is an outstanding pack and I’ll be using on my thru-hike. Granite Gear Crown 2 and Black Diamond Distance Z poles. Shelter system: I am using an REI Quarter Dome 1 tent and am very pleased with it. It is fairly light (2 pounds, 14 ounces), easy and quick to set up and, as far as one-person tents go, more affordable than most. I am 6 feet tall and did find it to be a bit tight on space when trying to get organized or change clothes, but that is no surprise in a one-person tent. I am using a large Tyvek sheet as a footprint. This works great and doubles as a sit pad during the day. I normally don’t like staying in shelters, but on this trip did so twice. I have to admit that if it works with your plan, staying in shelters can be pretty darn convenient. No need to set up the tent, usually a nice water source nearby, a privy, and a bench or picnic table where you can cook your food and eat. Shelters also provide opportunities for social interaction if that is something that is important to you. I met some great folks at the shelter and, for me, that was one of the highlights of the trip. I did find sleeping in the shelter to be much, much colder than sleeping in my tent. Sleep system: I am using a Mountain Hardwear Lamina Z Flame 22 degree bag. It worked fine and kept me sufficiently warm on some cool October nights. I have been going round and round about possibly switching to a down bag or a quilt but, in the end, decided to stick with this bag for now. I am using an REI Flash full-length inflatable pad and am pleased with it so far. I’m a little concerned about the risk of punctures over the course of a long and demanding thru-hike but am bringing some basic repair items (i.e., duct tape) that will hopefully see me through. Trekking poles: I am using Black Diamond Distance Z poles. This is my first season ever using trekking poles and now I will not hike without them. They take the pressure off the knees on the downhills, provide a great assist on the uphills, and help with stability on rocky and technical trails and stream crossings. The only negative I’ve noticed so far with these poles is that the straps are beginning to fray around the edges. This is a bit disappointing since the poles are still fairly new. I’ll probably need to replace the straps at some point in my hike. 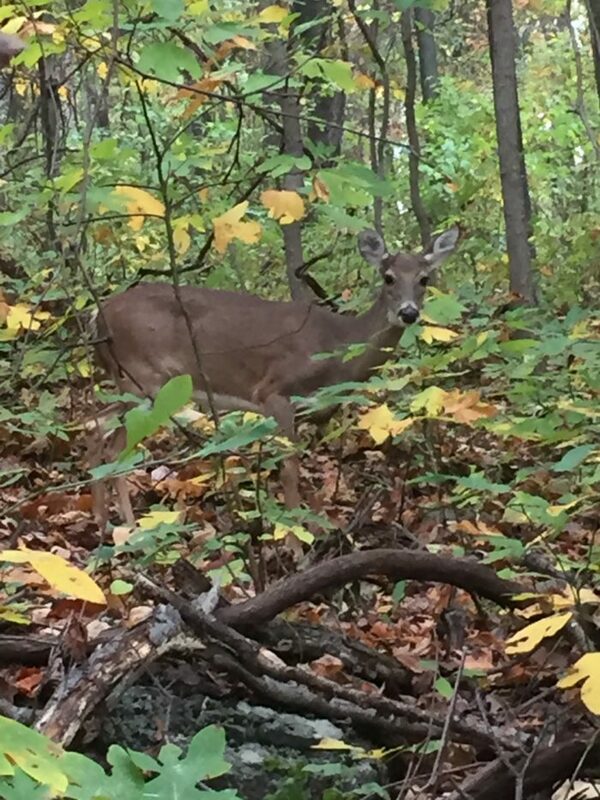 Early morning hiking companion. Didn’t talk much. Footwear: I experimented with a bunch of different footwear options over the course of my five shakedown hikes (trail runners, mids, etc.) and switched back to my old Merrill Moab 2 Ventilator hiking shoes for this trip. I thought they were perfect and have decided to start with these for my thru-hike. Water: I used the Katadyn BeFree filter on this trip and was impressed with how very easy it is to use. On my first shakedown hike, the flow rate was nothing short of amazing. By the fifth shakedown hike, however, I think I did notice a slight slowing of the flow rate, something that others have remarked upon as well. On a couple of days I also had to deal with a very low spring that was not really well suited for the BeFree. For future trips, I will cut off the bottom of a Smartwater bottle and have that on hand to scoop up water from low springs like that. The BeFree will be another item I will start out with, see how it goes, and switch it out if necessary. I usually only carry two liters of water at a time but on an earlier shakedown hike I ran into a couple of dry camps where I had to make a choice between using my last bit of water to make dinner, to make the next day’s breakfast, or save it for the next day’s hiking to get me to the next water source. I didn’t like having to make that choice so I broke down and bought a two-liter Platypus and brought it along on this hike. This was the first time I’ve ever packed one of these things and, like the trekking poles, this will now be part of my standard kit. I loved having that extra water in camp and the flexibility you get is worth the extra one ounce of weight (unfilled), in my opinion. Kitchen: I did freezer bag cooking using an MSR Pocket Rocket 2 and a Snow Peak Titanium 700 mug. This replaced the GSI Soloist kit I had been using. The stove and mug worked great and boiled water quickly and efficiently. I’ve read that some folks think the Snow Peak’s handles get too hot to handle when cooking but I did not find that to be the case. The only negative is that the lid on the mug is loose fitting and will not stay in place on its own. I store my stove, lighter, and fuel canister inside the mug so I just secured the lid with a rubber band. I did notice that the Pocket Rocket can be very loud when you crank it up. 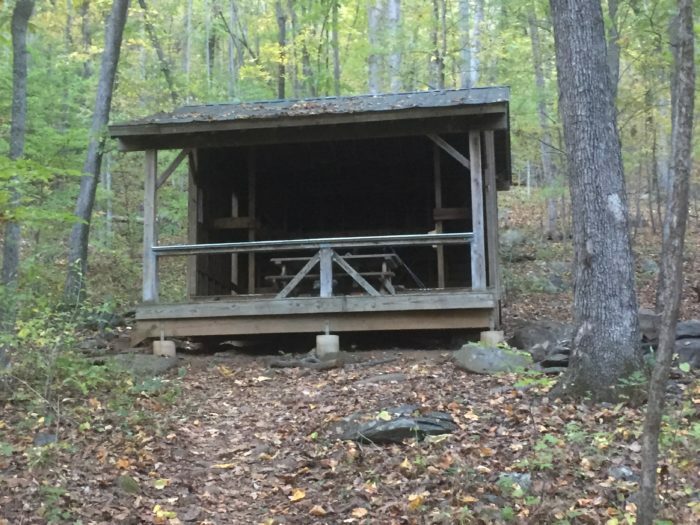 Food storage: I hung a bear bag for two nights on this trip (using the excellent but pretty expensive Zpacks bear bag kit) and used a convenient bear pole at a shelter on the two other nights. On earlier shakedown hikes I experimented with both a bear canister (too heavy and bulky) and an Ursack (I liked it and it sure was convenient but I thought it was a bit heavy and didn’t pack down very easily). Clothing: Socks – I brought two pairs of Darn Tough socks with me. After using these socks on this and previous hikes, I think I am just going to throw out all of my other socks. These socks are just about perfect. Fit well, breathable, dried out fairly quickly, did not seem to retain odors, and come with a lifetime guarantee. Love them. Shorts – Brought one pair of Nike running shorts and one pair of convertible pants. Both worked great and this will probably be the combo that I take on my thru-hike. I really like the flexibility and added protection from sun, bugs, thorns, poison ivy, etc., provided by the convertible pants. T-shirts – I brought two technical tees from REI that were quick drying, lightweight, comfortable, and worked great. Underwear – Brought two pairs of ExOfficio underwear, one with a four-inch inseam and one with an eight-inch inseam. I thought the eight inch worked much better (less chafing and riding up) and also were quick drying and had impressive odor control. Sleep clothes –I used Patagonia Capilene top and bottoms. Very comfortable, warm, and could double as a hiking base layer if the weather turned really cold. I also brought both a fleece and a puffy jacket, which I initially thought was a bit of overkill, but I was glad to have them both when the temps dropped to the low 40s one night. I slept wearing my puffy every night and the fleece wrapped around my clothes bag made for a great pillow. 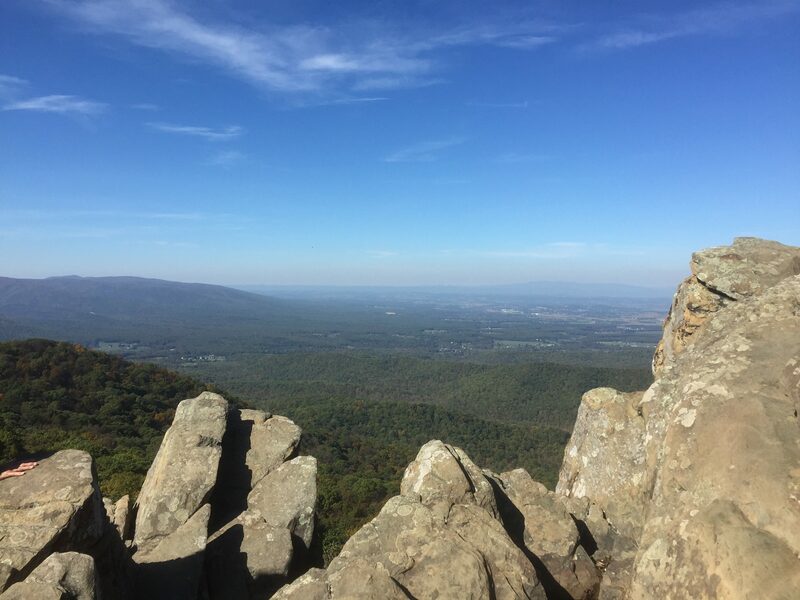 The view from Humpback Rocks. Odds and ends: I learned about chewable toothpaste tablets recently and used them for the first time on this trip. I thought they were great. Lighter and a bit less messy than a traditional travel-sized toothpaste tube. I will probably be using these at least part of the time on my thru-hike. I also experimented with some electrolyte replacement options on this hike. I’ve always just used Gatorade powder but was hoping to find something with less sugar. I tried Nuun’s tablets on this hike and was not a huge fan – the tablets are too large to fit in a Smartwater bottle so you have to break them up first. I found this could get messy and sticky if your hands are wet (which they often are after loading up on water). I also brought a roll of Saltstick Fastchews and these things are awesome. They are not budget friendly but they sure were tasty. Night hiking: I had an interesting experience with night hiking on this trip. It was an out-and-back hike and on the return leg I was trying to make it to a campsite I had spotted on the way out. But that day I had a nice leisurely two-hour lunch break at a great view and then spent another hour in an unexpected but wonderful conversation with someone I met on the trail. All this meant I spent two to three hours hiking in the dark and setting up my tent, making dinner, hanging my bag, etc., with only my headlamp for light. I am using a Black Diamond Ion headlamp and thought it was excellent – very small and lightweight, provided a ton of illumination, and has dimmer, strobe, and red light options. It was a great experience and I recommend that everybody try night hiking and setting up camp in the dark a few times before doing a thru-hike because you just never know how your day is going to unfold. All in all, a great hike. The trail was outstanding and the Old Dominion Appalachian Trail Club has done an incredible job with the trail maintenance. The hike was about 45 miles total, including both very low mileage days on the first and last days (due to travel to and from the trailhead) and a 15-mile day in the middle (the day of the night hike). This made me realize that when it comes to hiking I like both “smiles” and “miles” and will do some combination of both on my thru-hike. It also made me realize that I may be being a bit too conservative by only planning to do eight miles a day my first few weeks on the trail. The 15-mile day was long but did not destroy me and I felt fine the next day. So I think I can safely adjust my planned mileage upward just a wee bit for those first few weeks of the thru-hike. This turned into a bit of a lengthy post, but I hope it is useful to some folks who might still be thinking through some gear options. See you on the trail! A quick way to drop two pounds is to only carry one liter of water. Aside from one or two times where i carried 4 or more liters (for dry camping) it was plenty; most other thru hikers that I asked also only carried one. If you have AWOLs guide or especially Guthook it’s super easy to check distance between water sources. Thanks! Just bought Guthooks last week and it looks amazing. I just saw that you’re up in DC! I’m just down south from you about 5 minutes from PW Forest Park, I hike there all the time. I thrued last year and would be happy to chat with you about it or answer any questions. Maybe swap some whiskey on an overnight if you like. PW Forest Park is awesome – one of my favorite local places to go hiking. I’m leaving in a couple weeks for my thru but plan to be posting and maybe vlogging here. It is going to be awesome!